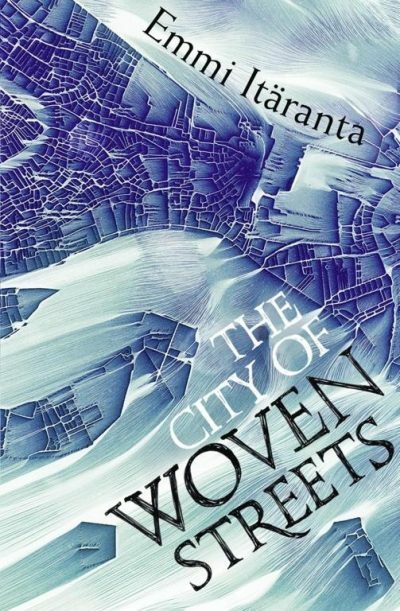 Emmi Itäranta’s 2015 standalone secondary world fantasy Kudottujen kujien kaupunki was published in 2016 as The City of Woven Streets. And also as The Weaver (for some reason I cannot comprehend). The island on which Eliana lives is controlled by a Council much concerned with contamination by uncanny dreams and other such temptations to … well, if I told you more that would be a spoiler. Those deemed Tainted are isolated, a precaution to prevent the spread of Taint. This has not been working well. The island’s rulers do the only sensible thing: double down on enforcement. It’s a small, harsh world. Eliana of the House of Webs has very good reason not to draw attention to herself. Those the Council notices have a tendency to suffer unpleasant fates. When Eliana stumbles across a maimed, tongueless woman, she should have walked on. Instead, Eliana made sure that the bleeding woman got the help she needed. This reveals a curious fact about the stranger; she has Eliana’s name tattooed on her body in invisible ink. The stranger is Valeria Petros. She has been attacked and her family targeted. Valeria’s parents were dropped to their death from an overhead gondola. Accident? Probably not. Valeria hides in the House of Webs that succoured her. Eventually Valeria too disappears. But before she vanishes, she and Eliana have befriended each other. They have also begun to share some surmises as to why Valeria’s parents needed to die and why it was important to silence Valeria. Eliana cannot leave well enough alone. She looks for Valeria, undeterred by the possibility she might expose her own dark secrets. That is to say, her gifts. As a result, the humble weaver from the House of Webs becomes the harbinger of her society’s doom. In the Council’s defence, their measures against Taint may not have worked, but the police state has created gulags full of slave laborers who can be worked to death … thus enriching the island and the islanders who look the other way. I should note that the novel is set in an archipelago world like Earthsea, and the Council controls only one island out of many. Their subjects suffer, but this is not a grim meathook world in which everyone does. Or at least everyone but the rulers. The plot of the book is somewhat of a well-worn premise, but the book was redeemed (for me at least) by its elegant prose and its interesting characters. Experienced readers will have previously encountered variations on the authoritarian, brutal Council, but they may not have met people like Eliana and Valeria. The City of Woven Streets is available here (Amazon) and here (Chapters-Indigo). "Eventually Valeria too disappears. But before she vanishes, she and Eliana have befriended each." There seems to be a word missing at the end of the.